The International Hockey Federation (FIH) has announced a brand new competition – the Hockey Series, which will provide a qualification route to the Tokyo 2020 Olympic Games and future Hockey World Cups. Starting with the Hockey Series Open and progressing to the Hockey Series Finals, these events will be played in the two years preceding either an Olympic Games or Hockey World Cup. They will culminate in a series of Olympic or World Cup Qualification Events with the winners guaranteed a place in one of hockey’s pinnacle competitions. All FIH National Associations not participating in the Hockey Pro League will be eligible to enter the Hockey Series Open. Events at this level will be continentally based, with the number of competitions being determined by the amount of team entries. As part of a commitment to support the sport’s growth at all levels, these events will be available on FIH YouTube, giving fans instant access to hundreds more hours of hockey action from across the world. 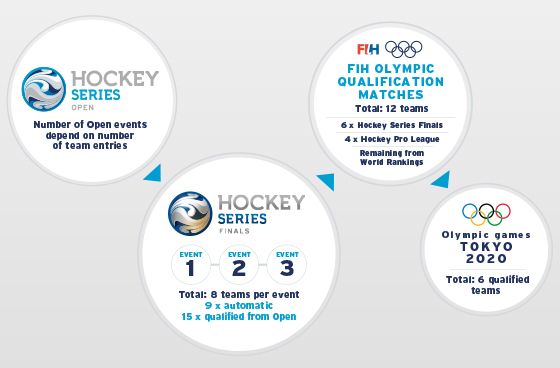 A minimum of 15 nations will qualify from the Hockey Series Open for one of three Hockey Series Finals. There they will meet the top nine nations in the FIH Hero World Rankings not playing in the Hockey Pro League. Each of the Hockey Series Finals will have eight nations playing in them and will take place at three venues across the world between May and June 2019. The top two* nations from each of the Hockey Series Finals will then be guaranteed berths in the new Olympic Qualification Events. They will be joined by the top four nations from the Hockey Pro League and the two highest placed nations in the FIH Hero World Rankings (at the end of the 2019 Continental Championships) not already qualified via the Hockey Series Finals or Pro League. The 12 men’s and 12 women’s nations will compete for a total of six spots in the Olympic Games, with the winners joining hosts Japan and the five continental champions who automatically qualify for Tokyo 2020. The six Olympic Qualification Events will each feature two nations playing two back-to-back matches, with nations drawn to play each other based on their rankings at the end of the 2019 Continental Championships. The nation who scores the highest aggregate score over the two matches will qualify for the Olympics. The Olympic Qualification Events are scheduled for October and November 2019 and the matches will be hosted by the higher ranked of the two competing nations. For detailed information about the Hockey Series and Olympic Qualification, visit the Q&A page on the FIH website here. You can follow all the latest news about the Hockey Series via FIH.ch and through FIH Facebook, Twitter and Instagram.